I ran into a new supplier of pasture raised, grass fed, hormone free beef at the Santa Rosa Veteran’s farmer’s market last Saturday. 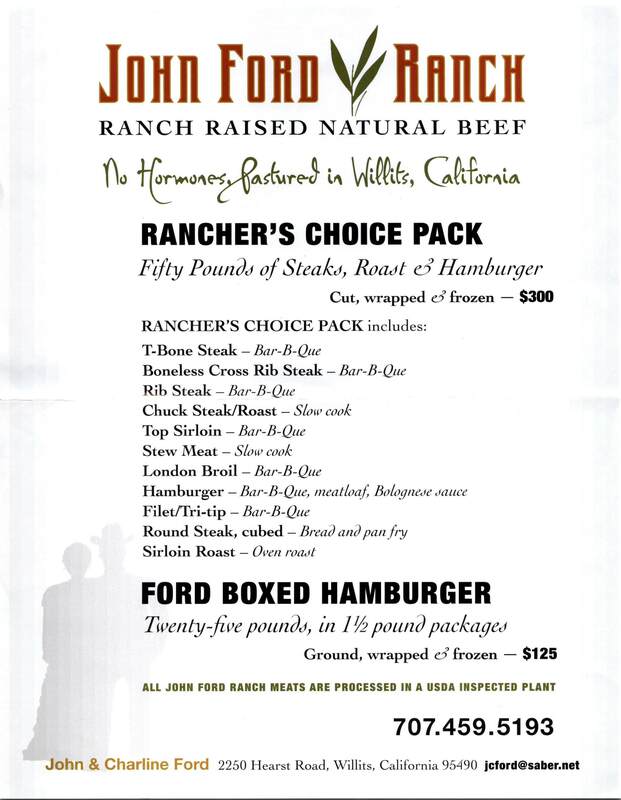 John Ford, of John Ford Ranch in Willits, was on hand to sell his fine selection of beef. Though not a member of the Sonoma County Meat Buying Club, John is a local purveyor and looks forward to being at the Saturday market for awhile. Santa Rosa Veteran’s farmer’s market hours are 8:30am to 12 noon on Saturdays. Check out their blog to learn more, and see a pic of John at http://santarosafarmersmarket.blogspot.com. Please note: John mentioned that he will miss the upcoming Saturday, January 16, but will return the following week. A current price list is included. Enjoy! ← TLCD Architecture Up to the 1,000 Pound Challenge! Nice DK, thanks for the info!